The New Jersey eviction notice forms are used when a landlord seeks to have a tenant removed. The landlord does not need to notify tenant that (s)he hasn’t paid the rent when it is due, but if there is another breach, then you have to provide the tenant with notice and give her/him an opportunity to rectify the situation. If tenant continues to breach the lease after the time period given, landlord can then file the Complaint and Summons with the Special Civil Part Clerk Offices and pay a fee. If the landlord prevails, (s)he can have the court issue a Judgment for Possession and obtain a Warrant for Removal. Grounds for Eviction Bulletin – Use as a simple guide to go through the eviction process. Non-Payment of Rent – Lease is terminated immediately unless the landlord has accepted rent that is late previously in the tenancy. If so, the notice is for thirty (30) days. Lease Violation – If the tenant violated a particular term or condition in the rental contract it shall be stated with the right to cure or vacate within thirty (30) days. Disorderly Conduct – If the tenant is considered destroying the peace and quiet of other guests on the property or neighbors they shall have to vacate within three (3) days. 30-Day Notice to Quit (Month to Month) – This form is for use in a landlord-tenant relationship, whereby one of the parties seeks to end a month-to-month lease by providing the requisite notice. Rent is due on the date specified in the lease, otherwise it will be considered late. Step 2- If the tenant has failed to pay rent or the tenant has failed to respond appropriately to the notice sent by landlord, the landlord may then proceed to the Special Civil kPart Clerk offices to file a Complaint and Summons and pay a fee. Step 3 – The court will serve the tenant and the landlord will receive a notice of when to appear in court. Step 4 – If the tenant defaults and/or the landlord prevails in court, landlord will get a Judgment for Possession. He then must apply for a Warrant for Possession to empower the sheriff to assist in removing tenant. Obtain a copy of the Rental Property Lease Agreement both Lessor and Lessee have entered together. You will need some of the information contained within this document to be precisely reported on this form. You may download the form using the PDF, ODT, and Word buttons below the image. The individual(s) this Notice is addressed to should be documented on the first line of this page. Report the City, County, Zip Code, Building Number, and Apartment noted on the Lease this Notice addresses in the first statement in that order. Several blank spaces will be provided for this purpose. 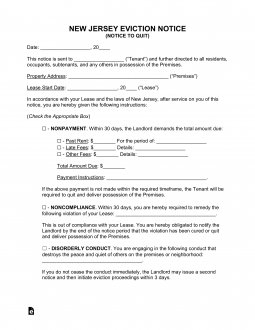 Review the Lease Agreement this Notice relates to and locate the Signature Date. Report the Calendar Day, Month, and Year of the Signature Date on the blank spaces in the second statement. If you are a Landlord, then select one of the first four check boxes and proceed to Item 7. If you are a Tenant issuing a Notice, do not mark any of these four statements and proceed to Item 6. To send a Tenant a “Nonpayment” Notice, select the first check box. Then, enter the Name of alternate party who may accept delinquent payments on the blank space after “the undersigned or.” Also, you will need to report the Total Dollar Amount Owed on the next two spaces. In the bold statement, report the Required Dollar Amount the Recipient(s) must pay to remain on the premises and the Rental Period this payment will be applied to. This statement demands the Tenant pay the Required Dollar Amount or relinquish possession of the premises to the Landlord in Thirty Days. To send a Tenant a “Noncompliance” Notice, select the second check box and report the Lease Term Offense the Tenant is guilty of on the blank line. This statement will give the Tenant Thirty Days to cease violating the Lease Terms or vacate the Rented Property. To send the Tenant a Disorderly Conduct Notice then select the third check box and report the non-compliant behavior the Tenant is guilty of on the blank line. This statement gives the Tenant Three Days to return the Leased Property to the Landlord and leave the premises. To send the Tenant a Month To Month Tenancy Notice, select the fourth check box, then report the Date you wish to terminate the Month to Month Tenancy Agreement you have with him or her using the blank spaces in this statement. This statement must give the Month to Month Tenant at least Thirty Days’ Notice that you are ending the Month to Month Tenancy. If you are a Tenant issuing a Notice, follow the instructions below then proceed to Item 8. To send the Landlord a Month to Month Tenancy Notice, select the fifth check box then enter the desired Termination Date of the Month to Month Tenancy using the three blank spaces available to report the last Calendar Day, Month, and Year of agreement. This must be Thirty Days or more after the Landlord’s receipt of this information. Directly below the Month To Month Tenancy section will be a Disclosure Paragraph. This paragraph applies to Landlords and/or Landlord Agents involved with the issuance of this paperwork. Landlord/Agents must provide their Signatures on the blank line at the end of this paragraph. Delivery Acknowledgement may only be provided by the individual serving this document to the Recipient after the action of delivery. The “Certificate of Service Section” has been provided for this entity. This section will require the exact Date of Delivery, the Name of the initial Recipient, and the manner in which this paperwork was delivered to be defined. This definition will be made by mark in the check box corresponding to the appropriate statement. There are three methods of delivery to choose from: Handed to the intended Recipient, left with a reliable individual who will complete delivery at the intended Recipient’s home or place of work, and sending the paperwork through the U.S. Postal Service First Class Mail.